I hope my readers don't find this one too boring. When reading Ultra-marathon reports it's much more interesting when there is lots of pain and suffering going on with epic struggles to finish but I'm happy to say there was none of that happening for me last Saturday. Pain and suffering may make for better reading but I find it is a whole lot more fun running when things turn out like they did for me at Weymouth. Ok, I almost got a blister on my left big toe but even that turned out to be nothing much. My main goal was to get under 14 hours so that I could get a qualifier for Western States in the bag early and not have any pressure later on which will help make for a more relaxed year ahead. Of course I still wanted to race this thing and run as well as possible so I lined up for the 8am start with about 75 others with a plan to get the desired results. It was in the upper 20's and calm so I was dressed warmly but hoping to shed layers quickly. The 4.5 mile loops made it perfect for setting up a personal aid station for quick changes of gear and making sure I had everything I needed for each lap. 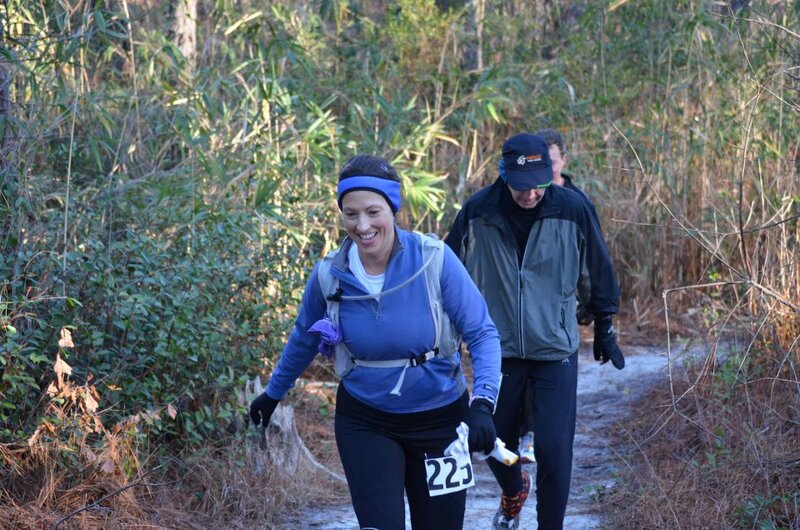 My plan was to go out at an easy, relaxed pace for the first loop and then see how I felt. I was also hoping to get in at least a few miles with Jenn and Amy so we lined up together. The first lap went according to plan with the 3 of us and a few other friends staying close together. I stepped on a root in the first mile and tweaked something in my upper right hamstring that would make me a bit sore for awhile but fortunately it was never an issue and went away after a few laps. I was already getting warm in my jacket so as we came in for the first time I quickly removed it and put on my vest. I was a little surprised at how long that lap took (51:48) but I was feeling good so as I began the next loop I picked up the pace as planned. The faster pace felt good but by the time I came back around I knew I wouldn't be able to hold it for too long so although I was a a little over 3 minutes faster(48:34) I backed down to a more reasonable pace. Lap three was just about perfect for what I wanted (51:24) and I had about a 28 minute cushion to work with for the 14 hour finish so everything was looking good so far. 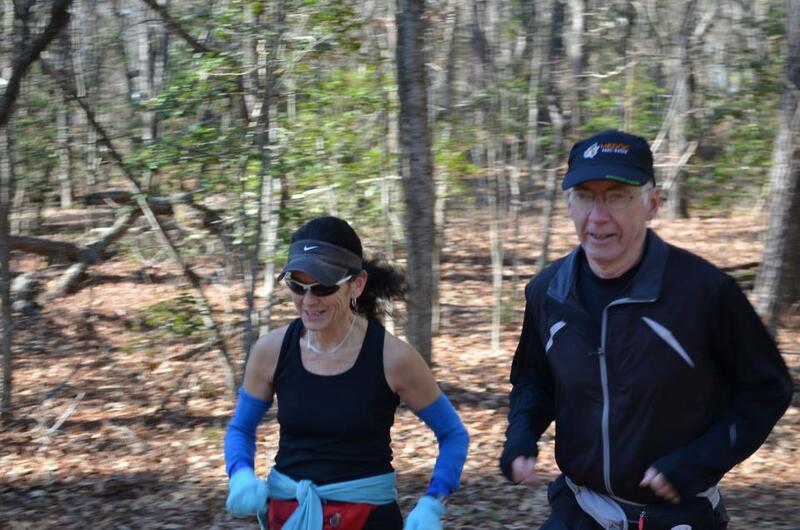 As I was finishing up lap 4 (54:34), I spotted my friends Margherita and Tony coming down the hill looking for me. They followed me into the aid station where I quickly changed out of my long pants into some shorts as my legs were getting sweaty. I usually just wear shorts all the time unless it is going to be below freezing the whole time and it was now warming into the low 40's. The three of us headed out quickly to begin lap 5. I was still under the pace for 14 hours but it was already obvious I wouldn't be going much faster than that and my 12:30 fantasy goal was truly a fantasy. It was nice to have a little company along for a change. The last couple of laps I'd been a alone and when I'm racing it's hard to find someone going your pace in a small race. Everyone else was either going too slow and I would pass them or too fast for me to try and stay with. 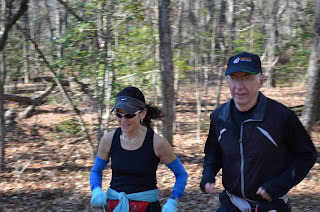 Margo had just ran a great 4:49 at the Frosty 50k the weekend before but was having no problem going with the easier pace today. Tony is not a runner but a mountain biker and avid outdoor sports enthusiast so although he struggled a bit he hung with us for that 5th lap (57:52). I did fall one time tripping over a root but it was a soft landing with no damage done and I was up and on my way. Tony stopped after one but Margo went back out with me for the next two. We had a great time talking and getting caught up since we haven't had much time together for a long time. My time were pretty consistent but I had been slowing down about 3 minutes per lap since the second one. Lap 6 was slower but not as much time lost so I was hoping the pace deterioration would level out for awhile. On lap 7 I was beginning to feel tired and I was letting Margo do most of the talking. It's pretty normal for me to hit a bad spell somewhere between 25 and 35 miles and we were right in that range now. The good thing was that I wasn't feeling very bad at all, just a little tired and sluggish and hopefully that would turn around as my body made the transition to burning more fat for fuel. So, I was pleasantly surprised to only lose one minute off the pace with that lap in 1:00:30, giving me a time of 6:24:15 for the halfway point at 50k. That was a little slower than I'd hoped and I was also over an hour for a loop sooner than I wanted but at least I was still feeling pretty good. I said good-bye to Margo and Tony and was back to the business at hand, getting out for another loop as fast as possible. At this point I must mention the great volunteers working the aid stations. All of them are knowledgeable and encouraging and it would have been great to spend more time interacting with them but I was a man on a mission. Although they kept offering me some of the great food that was available I had to decline and stick to my fueling strategy. I have felt my best in most ultra's sticking to just sugar, chocolate in particular when it's available in cooler weather and gels . Today I was taking a gel on the far side of the course and then when I went through the main aid station I would grab a handful of M&M"s. As each lap passed it became more tempting to enjoy some of the burgers, pizza, soup and sandwiches among other things but I stuck to my plan. I was even able to decline the grits that Doug and Jimmy had at the far side. I was very disappointed early in the next lap to catch up to my training partner and Angel Amy. Her knee which had been giving her problems since the last week of December had flared up near the end of the first lap and she was reduced to walking most of the time now. I walked with her for a minute but then had to hurry on my way. I had checked the last time around and was happy to know that Jenn was having a good day only about 5 minutes behind me so I was hoping she would continue to run strong and get a qualifier too. When I arrived back around I was very happy to have maintained pace on that lap in 1:00:41, only 11 seconds slower than the previous lap. Six laps to go and a 35 minute cushion to work with. I was beginning to feel a little lightheaded so I begin eating a mouthful of chips to get some sodium into me and I did take one E-Cap before going out for lap 9. That lap was uneventful as most were but I did lose some of my cushion with the time of 1:03:59. That wasn't too bad but I knew I would probably slow down a lot more once the sunset and I would have to try to get over the roots by flashlight. It was already getting hard enough to pick up my feet and not stumble over them now just from the growing fatigue. I grabbed my headlamp which I actually wear around my waist just in case. I expected to be back well before sunset from the tenth lap but was just being cautious. I was still very happy with the way I was feeling. My energy level was good, the legs felt fine and although I could feel the miles behind me I was still running well. In fact I could hardly believe when I came back around that I had actually picked up the pace a little running lap 10 in 1:01:05 ! This was a real confidence booster as I would be racing the remainder of the event in the dark. I ran as far as I could in lap 11 before turning on the light but I hadn't gone far when I had to turn it on. I had dropped off my handheld water bottle and put my waist pack back on so I could carry a flashlight and still keep my hands warm. It had been fairly comfortable all day but never warm because I could tell my nose was cold all day. Now with the sun gone it was dropping back into the 30's and I wanted to stay as comfortable as possible and not risk hypothermia. I was almost shocked with how well I was running here at the 45 mile point in the race. My breathing was good and I actually was feeling and running better than I had hours ago, just at a slightly slower pace and the roots didn't seem to be as much of a problem as I had expected. I was also playing a mental game with the pacing figuring out how many loops divided by the amount of cushion I had. Hmmm, 4 laps , a 28 minute cushion means I could run a 1:07. well that one took 1:05:53. Still good. Lap 12 was another good one as far as my condition but it was the slowest so far in 1:07:44. I didn't think I could afford to slow any more but I wasn't sure I could run any faster since it was a pitch dark night and the moon was not out. I asked if Jenn was still close behind me but no one knew and I had to move on and just hope she was still running well. About 1.5 miles into lap 13 as I was going over one of the many boardwalks over the boggy areas when I happened to notice that the sky was crystal clear with the stars shining brilliantly above through the trees. It was one of those special moments that make these things so appealing to me and I nearly walked off into the bog as I found myself wanting to just stare at the sky. But I was on a mission so I had to go ! As I came into the aid station for the last time I couldn't have felt better. Lap thirteen was a minute faster in 1:06:59 and I was ready to put the hammer down for the last lap. I grabbed a cup of coke, took off my waist pack and was on my way out in just over one minute. This was awesome. How could I feel so strong after 58 miles?!?! The last lap was amazing. I was nearly floating over the roots compared to earlier in the night and I had finally turned my handheld light to it's brightest setting thinking it would surely last to the end. Well, that didn't turn out so good. By the time I was halfway around it was about dead. I changed out the batteries at the aid station but they were DEAD ! Why did I not test them at home ? !? I was about to just run it in using the one around my waist and it probably would have been fine but if it died on me I didn't have a back up so when Jimmy Ballard offered to get me one to use out of his truck I decided to take him up on it. I took off not knowing how much longer it would take to get back, only that I couldn't lollygag. But I didn't need to worry as I just seemed to get even stronger. I was even running hills that I had walked earlier in the day. I ran that last lap in 1:02:10 and would have surely been under an hour if I hadn't had the issue with the flashlight. I was more than happy to get my qualifier in 13:52:49 but even better to do it and feel so good all day. Amy was there to greet me having stopped at 40 miles. I asked her if Jenn was close but she said she had dropped behind further after dark and was at least 20 minutes back before the last loop. I was sad to hear that news so I went inside to change into some warm clothes and then went back out to wait for Jenn. She came along in 14:18 feeling good and she ran well but just had a hard time dealing with the roots in the dark. Quite a few other firends from NCRC and MTC were running and most did very well meeting and exceeding their goals which makes it even that much better sharing part of the day with them. 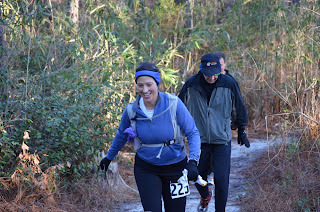 Marie Lewis is the race director for this and she is a wonderful person and put on an outstanding event. This was a runners race put on for runners by runners and it could not have been better. Awesome volunteers and the Park staff were great. I highly recommend anyone looking for a difficult but doable 100k ultra to give it a try. Great run effort that should easily yield a 3:45 marathon,the marathon is the true measuring stick for distance runners . .the running world awaits . . The Fan. Hmmmm, nice but I'm not even in the same galaxy as that performance.